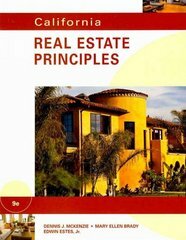 California Real Estate Principles 9 Edition Continuing the legacy of this well-known text, authors Brady and Estes have fully updated and re-energized the content to accurately represent modern real estate practice in California today. Coverage of the SAFE Act and its impact on mortgage brokers has been added along with current information on homestead laws, buyer's agency, senior community exceptions to fair housing laws, and much more. Each chapter includes learning objectives, preview, summary, highlighted important terms, practical applications and review questions to boost user comprehension and mastery of material. Designed entirely around the salesperson exam's content, this book is easy-to understand, yet rigorous in its learning models to reinforce information necessary to pass the exam. The 150-question practice exam included is similar in format and content to the actual real estate salesperson exam with answers and test-taking hints.